Shed Seven return with their first album since 2001's Truth Be Told. For a band that's made a success out of the reforming and biennial celebratory sold-out tour cycle for the past few years, it's a brave step to put new music out in the world when their audience might not be receptive to it. Instant Pleasures is classic Shed Seven though and dispels any such worries as it takes over where they left off so long ago. The approach in making your first record in sixteen years is a tricky one. Do you settle for the tried and tested that means you can still ten thousands of tickets or do you try and take your fans on the journey your own musical tastes and influences have gone on in the intervening times. 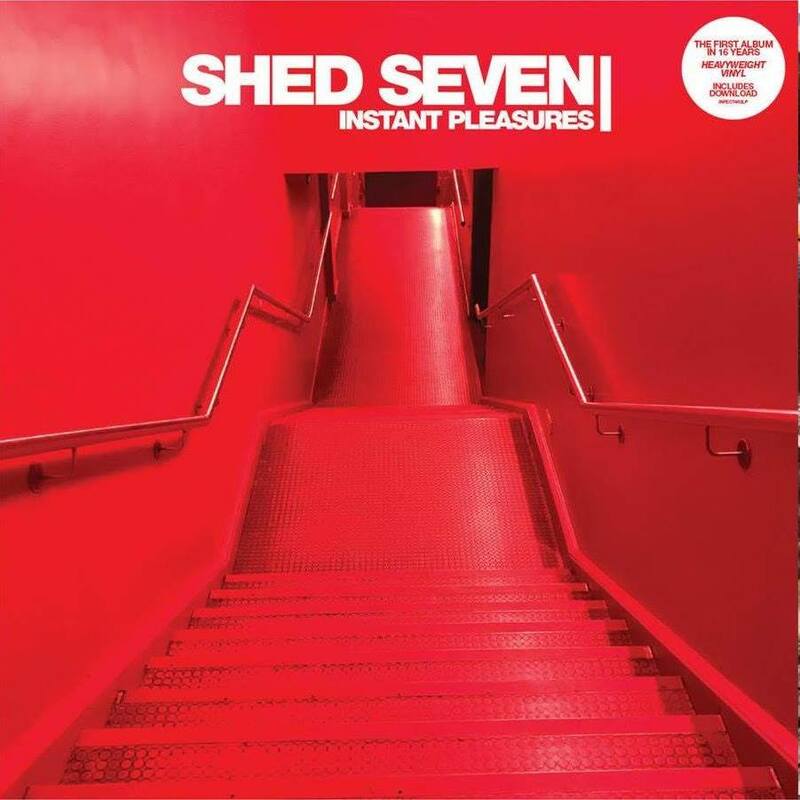 Shed Seven have plumped for the former and Instant Pleasures is an appropriate title for the impact that it'll have on the fan base that are eagerly awaiting to see what they've come up, a fan base that has pre-ordered it in sufficient numbers to have guaranteed a top ten slot any week so far this year. Room In My House is their opening call, the first song they revealed and it feels like they've just been in the studio at the end of the Let It Ride tour and pulled this one out of the hat. Rick Witter's voice is unmistakable as are some of his lines that appear simple on first listen, but which draw people in to sing along to them in thousands at live shows, lines such as "Ladies and gentlemen of the jury find me not guilty, and release me, set me free." There's a bit too much Kasabian-style harmonies going on in the background that aren't really necessary, but it's a minor quibble. It sets the tone for the rest of the record though. Many of these songs are not going to feel out of place on any of the previous four albums. Where many bands have tried to diversify or create an exact replica, Shed Seven have kept a firm reign on things but let them loose enough for the likes of Nothing To Live Down and It's Not Easy to breathe. The former is the sort of rollicking anthem that kicks off a moshpit within seconds, whilst It's Not Easy has the more restrained controlled epic feel that they'd turn to in order to mix things up in the plethora of singles the industry demanded in their heyday. Witter's voice still gives the songs a lift in just the right places as he sings "you knocked me for six when you stole my new tricks, it's how you get your tricks" and the backing vocals and hints of brass grow in the background and raise them still further until the song flies triumphantly off into the distance. Said I'm Sorry moves away from the sound of the first three songs, a loose fluid guitar line setting the pace in the verse, but the chorus comes back in and picks you up off your feet with lines like "I know I'm not perfect, but say that I'm worth it" in the way that songs from A Maximum High did over two decades ago. Victoria could be picked up and dropped in the middle of that album, such is the triumphant nature and uplifting spirit such as when Witter declares romantically "I'd buy a country and name it after you." Better Days slows things down a bit, but feels like a really huge song, epic in its intent and delivery other than when it drops down to a solitary piano and then builds back slowly. The second half of the album follows the rules laid down by the first. Shut your eyes and you can visualise arms being lifted, voices being raised as Enemies And Friends hits its chorus. Star Crossed Lovers and Butterfly On A Wheel have all the qualities required for a mid-nineties top three single that indie bands would regularly get in those Britpop glory years, whilst Hang On To Yourself is in the territory of songs that could end the set and leave the room united in love especially when it stops starts again, channeling Sympathy For The Devil and then drawing into gospel-style backing vocals. There's no studio trickery, grand gestures, just simple heartfelt lyrics that can mean anything to anyone but which draws everyone together. People Will Talk and the album closer Invincible use similar means to have you singing along to it by the end, such is the immediacy of much of this record. Instant Pleasures might not convince the haters, win them thousands of followers, but it'll delight the Shed Seven fanbase. It stands tall against the more celebrated albums in their back catalogue. It's true to its heritage, but without simply copy and pasting it. It keeps the band's traditions alive and adds a few new favourites to the set lists. Instant Pleasures is released on November 10th. Their tour calls at Inverness Ironworks (Nov 20), Aberdeen Garage (21), Edinburgh Liquid Rooms (22), Dublin Olympia (24), Leicester O2 Academy (26), Sheffield O2 Academy (28), Glasgow O2 Academy (30 / Dec 1), Newcastle O2 Academy (Dec 2), Blackburn King George's Hall (4), Stoke Victoria Hall (5), Cardiff Uni Y'Plas (7), Nottingham Rock City (8), Sheffield O2 Academy (9), Norwich UEA (11), Bournemouth O2 Academy (12), Bristol O2 Academy (14), Birmingham O2 Academy (15), London Brixton Academy (16), Leeds O2 Academy (18/19), Hull City Hall (21) and Manchester Academy 1 (22/23).